Here is an interesting article about Pembroke Castle and its role in English, Welsh and Irish history. 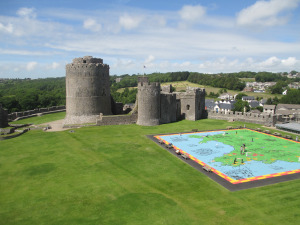 Pembroke Castle in South West Wales is one of the most impressive castles on Welsh soil. I hesitate to say Welsh castle, because it wasn’t built by the Welsh. The building of Pembroke Castle was begun by Arnulph de Montgomery in c. 1093 as a key part of the Norman subjugation of this portion of Wales. This first castle was nothing like the imposing fortress we see today jutting out into the Cleddau Estuary. Gerald of Wales, albeit writing much later, described it as “a slender fortress of stakes and turf.” But it was in an immensely strategic position and as such soon became an important fortress. By franklparker in Uncategorized on November 15, 2015 .